As the BNT V8s return from rounds three and four in the South Island, the championship has seen new points leaders emerge in both classes as the racing heads to Manfeild this weekend. Andre Heimgartner took the championship lead in class one from his teammate Jason Bargwanna following a round win at Ruapuna, while Chelsea Herbert took the championship lead in class two following round four at Teretonga from current champion, Liam MacDonald. With two rounds left and a 51-point buffer, Heimgartner is now focusing on what could be a maiden title win in the category. “I am really enjoying my time in the BNT V8s Championship – we have clinched all four pole positions, taken two round wins, and now lead the championship with two rounds left to run – it is safe to say it has been a positive experience so far!” Heimgartner said. Clinching his first win of the season at Teretonga was Nick Ross in his Nissan Altima, a good fight back following a dramatic off track excursion in race one of the weekend as a result of a wing failure. After showing impressive speed at Ruapuna, young Australian Jack Smith didn’t turn a lap after practice at Teretonga, retiring from the weekend with a blown engine. He’ll be one to watch at Manfeild, having adapted to his class one Holden quickly. And could be a surprise winner. Also watch for Lance Hughes, Brad Lathrope and Matt Tubbs in class one to challenge for podium finishes. For Herbert in class two, the battle with Liam MacDonald is still far from over. She currently enjoys just a one point lead over the reigning driver. MacDonald struck trouble with officials at Teretonga who found his car didn’t meet category technical requirements, when a carburettor insulator plate on the Speedy Signs Ford Falcon was found to be too thick by a margin of .34 of a millimetre have cost him dearly. The offending part had been purchased in good faith but it was found to be too thick by the barest of margins. Thus he lost the 75 points he had accumulated for his race win at Teretonga. The class two round win at Teretonga went to Brock Timperley who having never raced at the Southland circuit before recorded a pole position two wins and a second placing. The valuable points haul aiding his chances at claiming rookie of the year honours. “Very happy with the car at Teretonga, and being able to go there for the first time and adapt so quickly,” said Timperley. 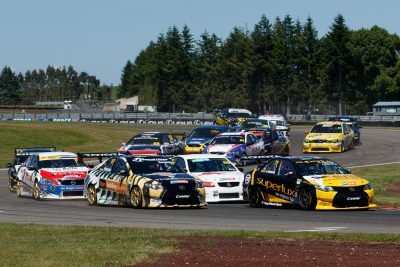 Timperley is locked in a tight battle with fellow rookie Justin Ashwell of Christchurch who battled engine issues at Teretonga. Ashwell holds the lead in the rookie standing, just 30 points ahead of Timperley. Also look for Rob Wallace, Nick Farrier and Matt Podjursky to make an impact at Manfeild, potentially spoiling the podium party for those in contention for the championship.